I am dreaming about macaroons. No, not those canned coconut chocolate ones that serve as snacks on the New Jersey Turnpike while driving to Passover Seders. 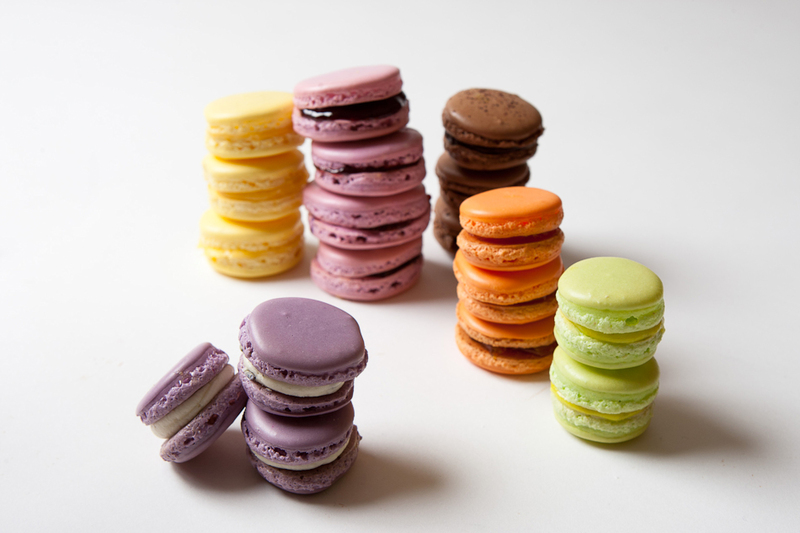 I dream of a rainbow of light, chewy, colorful French macaroons with delectable fillings. I imagine the macaroons I saw in Europe last summer that are flavored with caramel and salt, green tea, passion fruit, licorice, rose and litchi, and grapefruit, and wonder whether I can create them with Kosher ingredients. My obsession is not new. I fell in love with macaroons in pastry school in Paris. 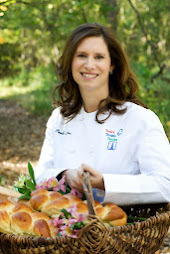 Even then my French teachers declared them “temperamental” because they require precision, no extreme temperatures in the kitchen and patience. 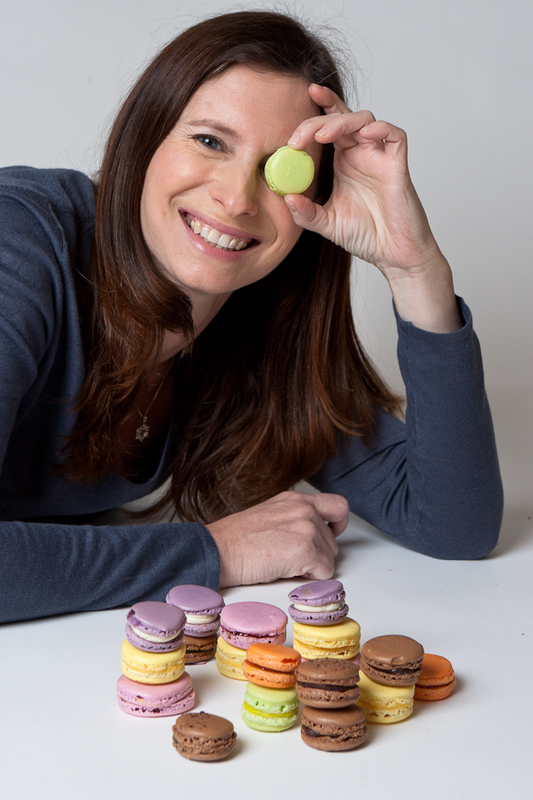 I was assigned by the fabulous new Kosher Inspired Magazine to write about French macaroons for their Purim issue. Thus began a macaroon marathon for two weeks straight. Don’t you wish you lived in my house? The truth is it was hard work. Although I have recipes for vanilla, cinnamon and raspberry macaroons in The Kosher Baker, I wanted to see if there was a way to improve on the recipe. These cookies present many challenges, such as how to achieve great colors without weighing down the batter with food coloring. The answer? Add the color to beaten egg whites and then add the almond/powdered sugar. I tried different oven temperatures, different rack positions in the oven; I varied the standing time for the cookies and used different colored baking sheets. Essentially I was running a laboratory. If baked too long, the cookies crumble. Too short, they are too gooey in the center and you cannot remove them from the cookie sheet. Too high a rack, the tops burn and all the color you worked so hard to achieve disappears. Too low an oven rack, the bottoms burn and you lose the chewiness. I baked small batches to see how each adjustment worked. The rejects may not look as pretty or be as chewy, but they are certainly edible and I ate them all as the kids were not home during my experiments. Ultimately, I learned that more food coloring is better than less and you need to use your best, unbent cookie sheets so that the cookie batter doesn’t slide. I discovered that Bakto Flavors extracts are great, especially their raspberry flavor, which added extra flavor to the pink raspberry macaroons featured in the Kosher Inspired article. If I thought that baking perfect macaroons was tricky, that experience was trumped by the photo shoot. Oh, the days of placing a cake slice on a plate and turning it left and right. Every adjustment of cookies required the precision of astronauts repairing the International Space Station to avoid cracking and cross contamination. It took many hours to get them right. After two-weeks I created gorgeous AND delicious cookies and only put on a few extra pounds—but nothing my Spanx can’t handle. I am now confident that I can tame these formerly moody cookies and, rather than let them get the upper hand, tailor the flavors and colors to my own mood. Have you tried baking these at home? They are worth the effort. Let me know if you have discovered any great tips. 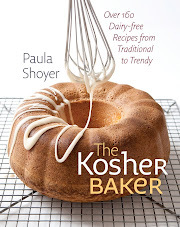 Look for the article, baking tips, step by step photos by The Kosher Baker photographer, Michael Bennett Kress, and the recipes for mojito, raspberry and mocha macaroons in the current issue of Kosher Inspired, found at Judaica stores, kosher supermarkets and newsstands, but not on-line yet. Line 2-3 cookie sheets with parchment, making sure the parchment fits perfectly flat on the sheet; trim if necessary. Lighter-colored cookie sheets work best. To make the cookie batter, place the almond flour and confectioners’ sugar in a food processor fitted with a metal blade. Process for 3 minutes. Sift into another bowl, discarding any large almond pieces. In a large bowl, beat the egg whites with a stand or hand-held electric mixer on high speed until stiff. Turn the speed to low, add the sugar slowly and the turn up the speed to high for 3 minutes. Add the lemon juice and food coloring and beat 30 seconds. Add the almond and sugar mixture and mix on low speed to combine. Place the batter into a pastry bag fitted with a ¼ -inch round tip. Squeeze out circles onto the prepared sheets until they are about 1 1/2 inches in diameter. Leave 2 inches of space between each circle. Let sit at room temperature for 1 hour. While the cookies are sitting, prepare the lemon cream. Place the eggs, yolks, and sugar in a heatproof bowl and set over a medium saucepan with simmering water (or use a double-boiler). Add the lemon juice and zest to the bowl and whisk. Cook the lemon cream, uncovered, whisking occasionally, until a thick mixture is formed. This takes approximately 25 minutes. Be patient and do not stir too much. Don’t leave the whisk in the bowl with the lemon mixture while it cooks; it may get too hot to touch. If the water in the saucepan boils too fast, turn down the heat. Remove bowl from the heat and whisk in the margarine a tablespoon at a time. Cool for 10 minutes and then cover with plastic and refrigerate 8 hours or overnight. To use that day, place the bowl of lemon cream in a larger bowl of ice water (below the level of the bowl with the lemon cream) for 20 minutes, or until the cream is chilled. To bake the cookies, preheat the oven to 300ºF. Do not bake more than two cookie sheets at a time. Bake for 20 to 22 minutes, until the cookies have puffed up, switching the cookie sheets halfway through baking. Do not let the tops brown. Slide the parchment off the cookie sheet and let cool at least 45 minutes. Use a metal flat blade spatula to remove from the parchment. To fill cookies, make pairs of them about the same size. Place about 1 to 1 ½ teaspoons of the filling in the center of the bottom of one cookie, place the other on top so the tops face outside, and then press gently so you can see the filling from the sides. Store in the fridge for up to two days. If they taste even HALF as good as they look, you've got yourself a winner. These are beautiful! I am planning on making some for pesach. Do you know if there is any kosher for pesach food coloring available?